Two men from Peterborough have been arrested after a video of a man seemingly sexually abusing a dog emerged on Facebook. Two men, aged 47 and 50, both from Peterborough, were arrested on Thursday January 5, on suspicion of producing/exhibiting/supplying a film involving the infliction of pain/terror/goading of an animal. 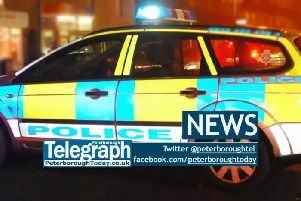 Both were taken to Thorpe Wood Police Station in Peterborough. Both men were given bail to return this morning Friday and have been subsequently re-bailed to return to Thorpe Wood Police Station in Peterborough on Thursday January 19. The RSPCA have confirmed a dog is now in their care. A police spokesman said yesterday: “We were contacted this morning (Thursday) by the local RSPCA Inspector for Peterborough regarding reports of a video published on social media of a man sexually abusing a dog. A number of Facebook users who have seen the video spoke of their disgust. The video allegedly showed men sexually abusing a white boxer dog then antagonising it to fight back, before it was beaten. An RSPCA spokesman said: “The RSPCA has been made aware of a video on social media of a man, thought to be from the Peterborough area, assaulting a dog.